These facial surgery procedures performed on either or both eyelids of the patient with intent to treat saggy upper eyelids and under eye-bags and restore a more youthful look for the patient. It is also known as blepharoplasty. This type of facial surgery helps reduce extremely large lips which may not only be uncomfortable but also a hindrance to speech. This refers to surgery intended to improve the appearance of ugly scars using a variety of procedures such as laser resurfacing, dermabrasion and needling. Scars may not be completely removed they can favorably improve using such procedures. Technically known as rhytidectomy, this is a cosmetic procedure that is intended to create a youthful appearance for the patient. This is achieved by removing excess skin and fat on the neck and the lower face and tightening the underlying tissues resulting in a youthful look. This procedure is designed to improve a drooping brow which if untreated ultimately causes deep grooves and forehead wrinkles. Many people opt for this procedure as an alternative to Botox injections. This involves the removal of excess fat and skin and tightening of the underlying tissues and muscles on the neck and jowls in order to correct and improve the appearance of a turkey neck. Commonly known as a nose job or nasal surgery, this is a surgical procedure designed to improve defects in the appearance of the nose as well as functionality. Common cosmetic nose job requests include; nose reduction, correcting a bulbous nose, hump removal and reducing wide nostrils. This is a fairly new technique in rhinoplasty. The goal of this surgical procedure is to alter and reduce the nasal hump without breaking the nose. It is a simple technique that is performed with local anesthesia at the office using a special micro-saw. These are procedures performed on the face. These are surgical procedures intended to approximate and reconstruct a ‘normal’ functionality and appearance of the face or facial features. They include techniques that are performed to improve scarring, repair facial features, and closing defects caused by accidents, trauma and tumor surgery. This refers to a surgical procedure done on the ear with the aim of improving the appearance of large, misshapen ears and/or ears that stick out. When corrected in children when they are young, it boosts their self-esteem as they grow older. This procedure involves the insertion of an implant over the jawbone in order to create the appearance of a more prominent chin. Chin augmentation also helps a person with weak chins achieve balanced and harmonious features which enhances general facial appearance. This involves the insertion of implants on the cheeks of a patient in order to add fullness to the cheeks. This procedure is usually performed on patients who desire high cheekbones or those whose cheeks have thinned out with age. This is a procedure performed on the cheeks with the aim of removing fat pads in people with chubby or big round cheeks in order to create a slimmer and a more elegant appearance. Buccal fat excision helps correct “chipmunk cheeks”. Aging is a normal stage in life. 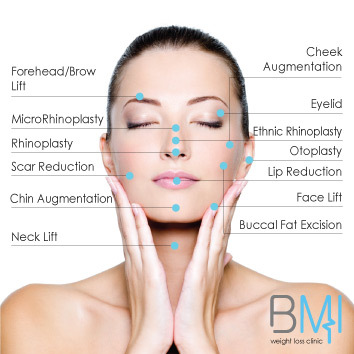 There a lot of comments on plastic surgery, however, facial plastic surgeries have a lot of benefits. Benefits on the overall frame of mind. Most patients who perform plastic surgery feel much better about themselves. Facial procedures boost an individual’s self esteem. They become more confident and comfortable in their social life. According to the American Society of Plastic Surgeons (ASPS), a lot of patients who were on antidepressants pre-facial plastic surgeries have stopped taking these pills post facial plastic surgeries. It is important to keep in mind that there are a lot of psychological benefits to facial plastic surgeries. To learn more about these procedures, do not hesitate to contact us.